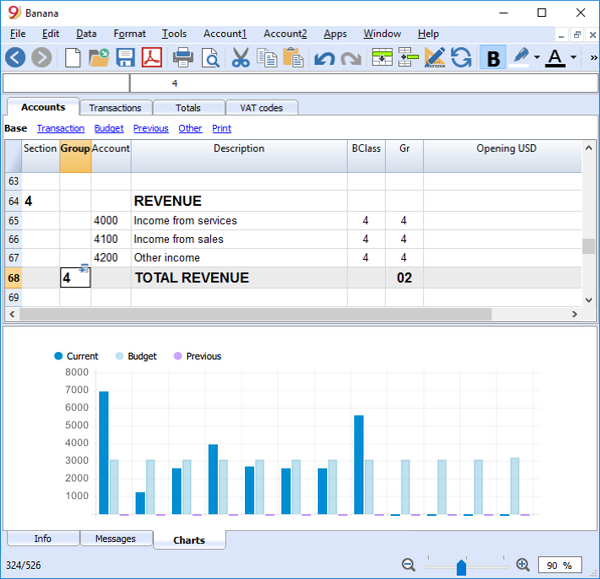 Banana Accounting 9 version will offer new and important improvements that will help users to manage their accounting more easily as well as more professionally. A single license key for all operating systems - Mac Version will be cheaper! 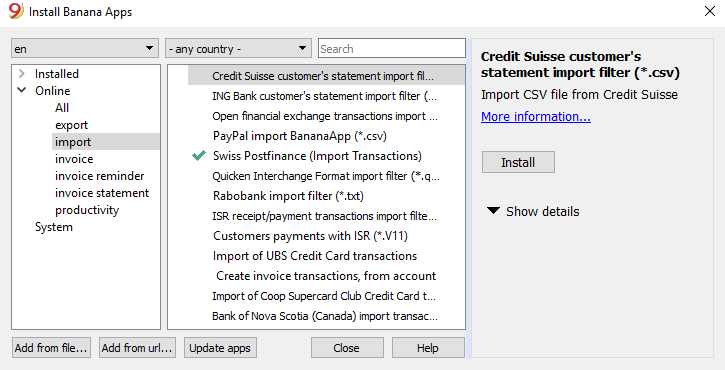 Unlike previous versions, the Banana Accounting 9 license key is unique to all operating systems. The cost is 129 Fr. VAT included, so the Mac version results much cheaper than before (Frs 129.- instead of Frs 189.-). The VAT Codes tab of the program has been updated with new prevailing rates. Rates valid till 31.12.2017 as well as those as from 01.01.2018 are included. Data will have to be copied into the official form. This function is particularly innovative because it allows the creation of invoices and the generation of the relative registrations simultaneously. You enter the items to be billed as if they were transaction and the program will then automatically generate the invoice. 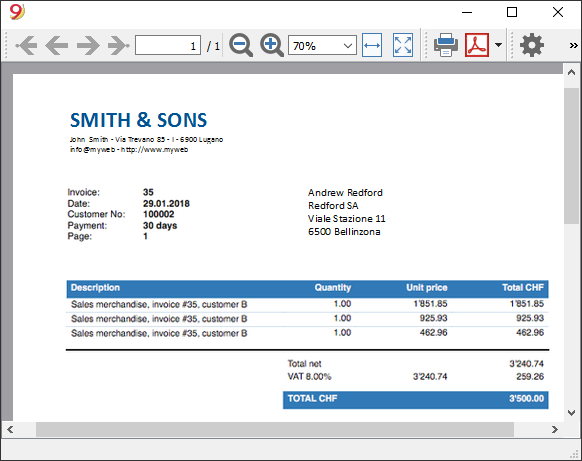 Various invoice templates are available and everyone can customize them by inserting their own logo. In addition to creating and printing invoices, via the Customers and Suppliers sub-menu, you can check the open, expired, paid and cashed invoices and send reminders. Prints of the Balance Sheet, the Profit and Loss account and of issued invoices can be personalized with your own logo. You can now generate graphs directly in Banana accounting. By selecting an account or group, it is possible to display a chart in the charts window at the bottom. The graph will allow you to instantly visualise the evolution of your situation, and even allow a comparison between your forecast and your actual figures. The new interface of Banana Accounting 9 allows you to select, in a very targeted way, the accounting template that best suits your needs. 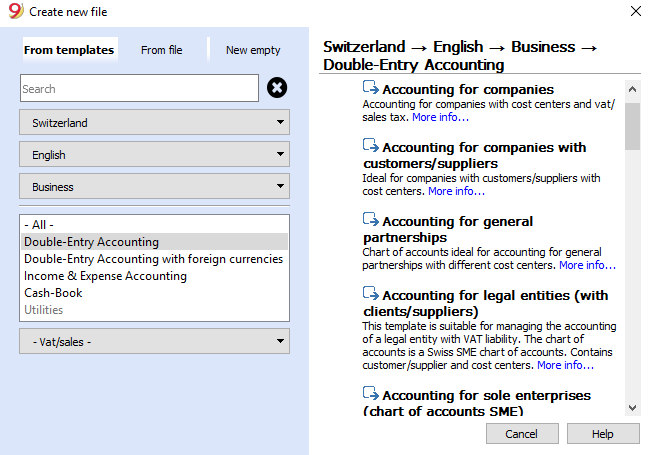 You can choose from more than 500 templates, divided by country, language, category and file type. Working hours spreadsheet - For free! 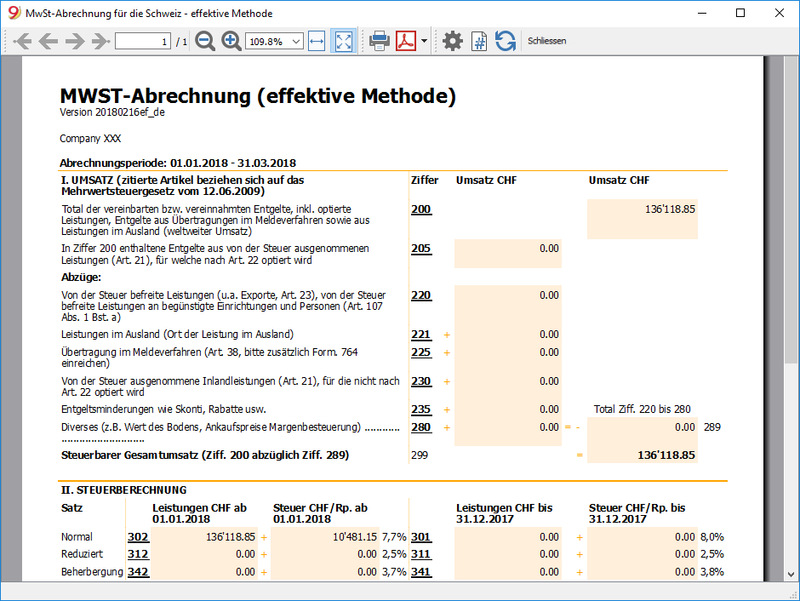 Banana.ch SA provides the new application for calculating working hours free of charge. Simply download Banana Accounting 9, install it and choose in the Hour Sheet utility. 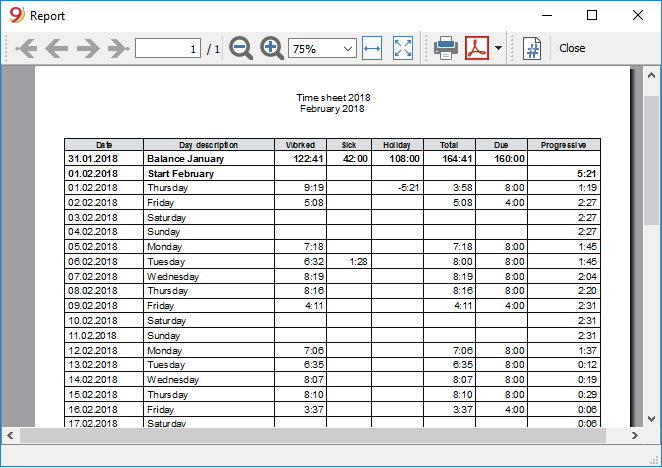 It allows to have a calendar for the count of working hours.This application is useful for both the employee, who has an easy-to-use tool to keep her/his working hours up to date, as well as for the employer, who has instant access to useful information for the calculation of salaries (such as overtime to be billed). The function also allows for monthly reports, with indication of ordinary hours worked, carry over of extra time of the previous month, holidays taken and to be taken. 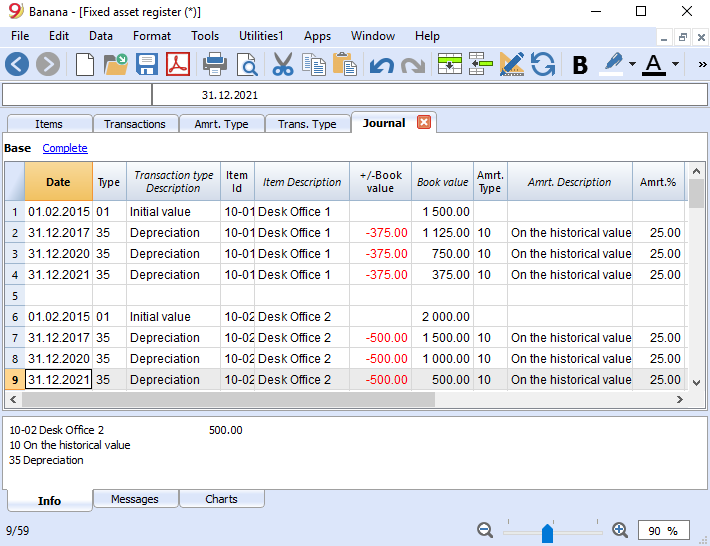 In the Tools section it is possible to set up a Register of depreciable assets. There are different types of amortization available. The journal lists all the depreciable assets, with their initial value, new investments, the divestments and the residual value. Depreciation records are calculated and transacted automatically at the end of the year. Installation via the list available online. Automatic update of new versions available online. Packages containing different features, with their own proper menus. Expansion of the API, with the possibility of expanding the functionality. You can choose from which file you wish to extract date, without any complicated settings,. The ExcelSync features allow you to recover Banana data in Excel and create sheets and graphs that update automatically. If and when new transactions are added, the Excel spreadsheets are immediately updated and calculated. This feature is not available for Apple / Mac.